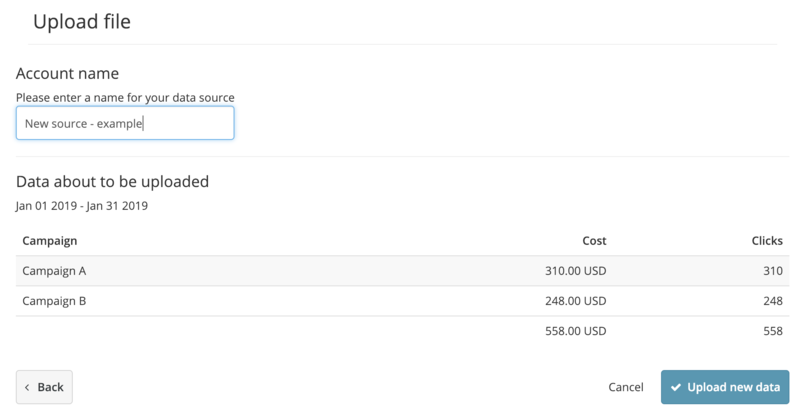 You can upload cost, clicks and impressions to Funnel using a custom Excel or CSV file. This article will teach you how to format and upload your data to Funnel, as well as how to use it after uploading. You can use this template for creating your first file for upload to make sure you get the formatting right. If you get a weekly report: Divide the cost, impressions and clicks by 7 days. If you get a monthly report: Divide the cost, impressions and clicks by the number of days in the month. If you get a campaign report with a specific time frame: Divide the cost, impressions and clicks by the number of days the campaign was live. 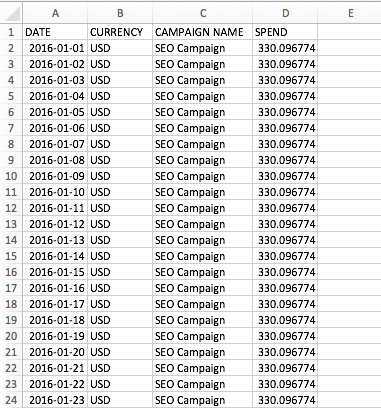 Below is an example of a file for the cost for a SEO campaign from January 1st to January 23, 2016. Date should be in the format "2019-06-20", "06/20/2019", "06/20/19", "Jun 20, 2019" or "20 Jun, 2019". Currency should be formatted with the three letter ISO 4217 code e.g., USD, EUR, GBP. 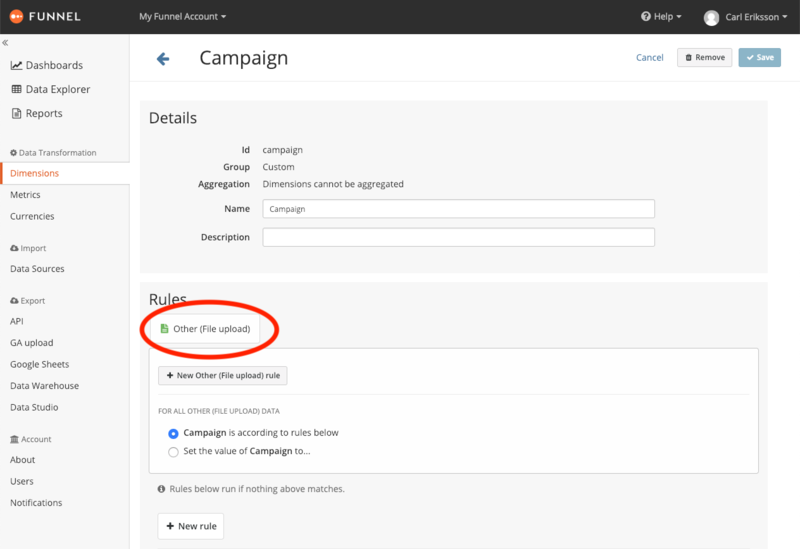 You can set the campaign name to what ever you want, but please keep in mind that if you want to match your ad data with the data from Google Analytics on a campaign level the campaign name needs to be the same as the utm_campaign tag. It's fine to have commas in your numbers, they will be removed though. Use dots between the integer and decimal numbers of your cost values. When the file is ready it's time to upload it to Funnel. Navigate to Data Sources in the left hand sidebar. 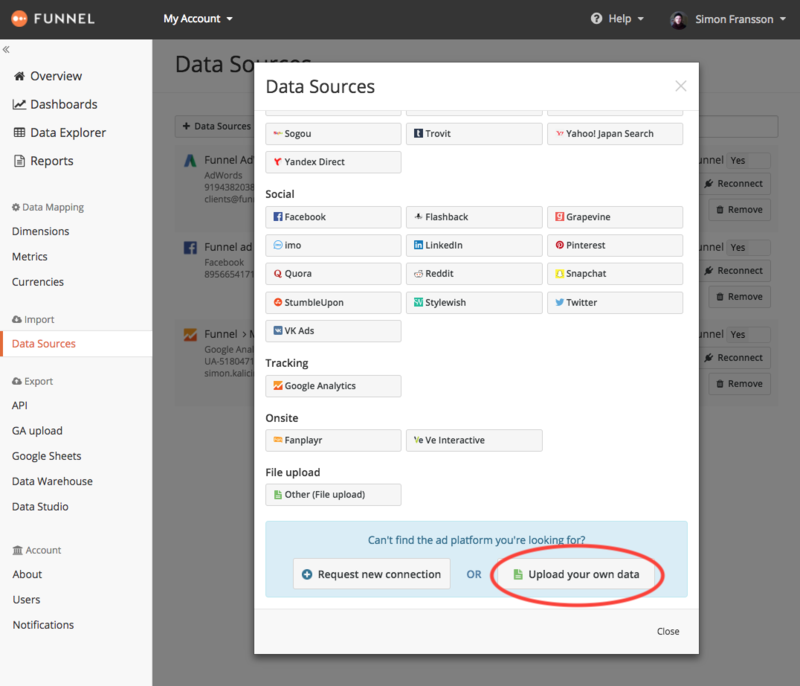 Click on + Data Source and scroll down to the bottom and select Upload your own data. Upload the file and make sure you get the right values for the different columns. Lastly name the file and click Upload new data. The file will show up as a new ad account in the ad account list in Funnel. We recommend that you name the file after the cost source, e.g., SEO, TV, The Economist Display. In this way you can simply add to the ad account with new campaigns or data for more dates instead of creating a new ad account. If you want to add more campaigns or add data for additional dates, find the data source in the list under Import > Data sources in Funnel. If you click on "Upload file" on the right hand side of the list, you will get an "Upload file" prompt. Use the same file as before with updated data in it, or an entirely new file with the just the new numbers you want to add to the previous upload. If you upload data for previously uploaded dates you will overwrite the previously uploaded data for those dates. There is a warning in the window that lets you know if you're overwriting any data. 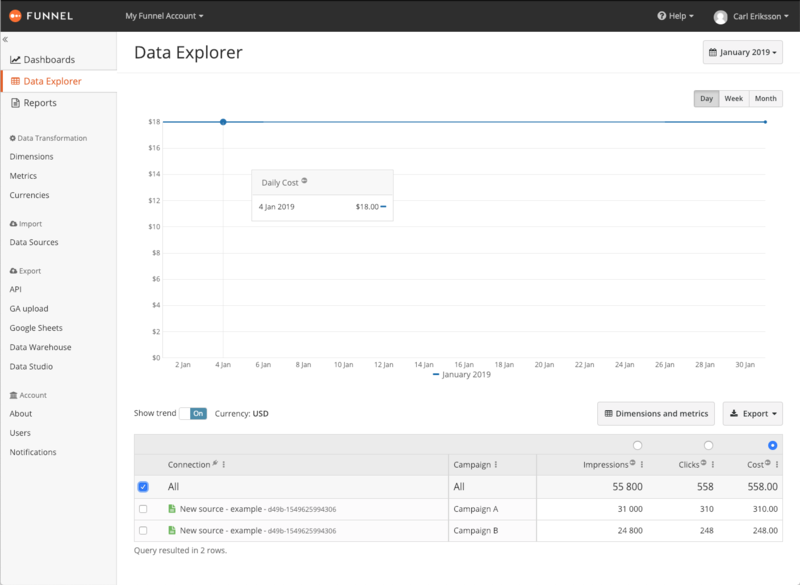 To see what data you have already uploaded to Funnel navigate to Data Explorer and select to view the Connection and Campaign dimensions. 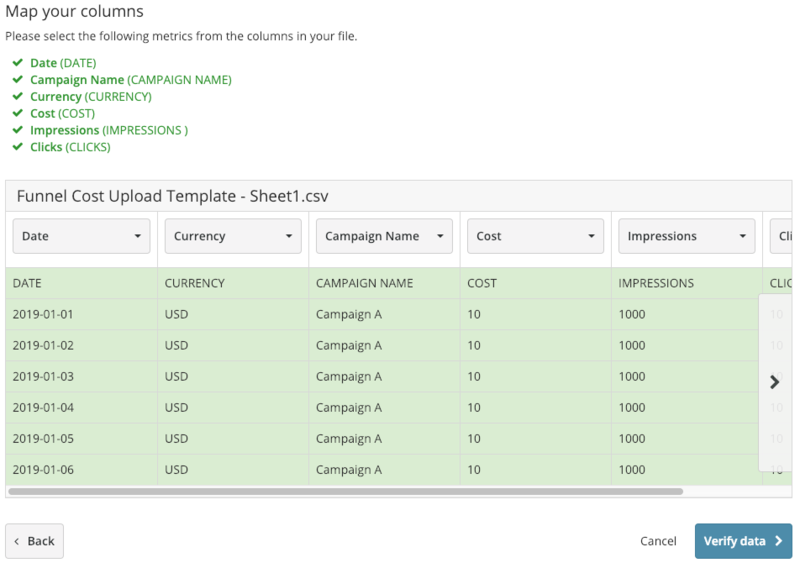 This will allow you to see the name of the campaigns uploaded and their value. This Data explorer view in the screen shot below is filtered to only show data from the connection "New Source - example". You'll notice that after having uploaded your first file, "Other (File upload)" will pop up as a new connection type in the dimension configuration. You can create dimension rules for this data just like you would for any other data source.